As this is the most popular island group in Greece, hotels in the Cyclades vary in accommodation type: visitors can find family studios and self-catering apartments next to super luxurious hotels, spa resorts and private villas with pool. This large range of Cyclades hotels certainly depends on the popularity of the island. Santorini, Mykonos, Paros, Naxos, and Ios are the most popular islands of the group and have fantastic upscale hotels and villas with super luxurious facilities. Enjoy the breathtaking caldera view from your private balcony with Jacuzzi in Santorini, or gaze at the Aegean Sea from your villa in Mykonos. These will be memories to cherish for a lifetime. The rest of the islands keep a lower profile in tourism, therefore Cyclades hotels there are equally beautiful but less luxurious. In these islands, such as Sifnos, Milos, and Folegandros, accommodation mostly consists of family apartments, self-catering rooms, and budget hotel rooms. Have a look at the Cyclades hotels that we suggest and feel free to contact directly any accommodation through their booking form to ask a question or make a reservation. 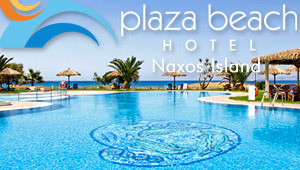 Many hotels in the Cyclades also have online booking engines to make your reservation quickly and easily. As we take no commission from any bookings made via our website, prices are cheaper. Before making your reservation, check for any Special and Last Minute Hotel Offers. Aegean Land Hotel is located just two steps from the white sand of Plaka, and is within walking distance from traditional taverns and cafes. It offers all modern comforts and leisure facilities, while still maintaining a traditional aesthetic and a peaceful environment. The hotel has a large outdoors pool, a modern gym, a spa, Jacuzzi and sauna. All rooms offer air conditioning, flat screen satellite TV, luxurious bathrooms, and private balconies with sea or pool views.